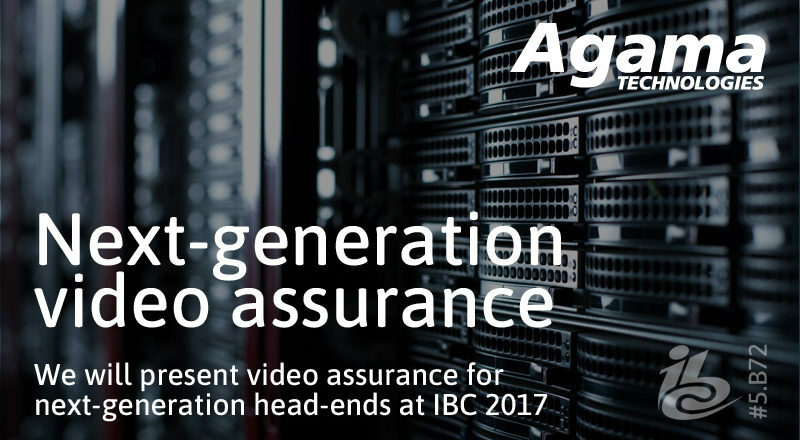 (Linköping, Sweden, August 31, 2017) – Agama Technologies, the specialist in video service quality and customer experience, will be presenting its video service assurance solution for next-generation head-ends and services at IBC2017. Modern video service solutions need to handle a diverse set of tasks at every step of the video processing chain. This includes Ultra HD/4K and ad insert in linear and OTT services, all while delivering to multiple platforms and screens. And, as well as supporting new formats and services, next-generation head-ends are also increasingly being built on software, virtualization and cloud technology. To ensure customer satisfaction, it is vital to maintain transparency and control throughout this entire complex process. Agama’s complete video assurance solution provides full operational transparency across all technologies and services: ingest; transcoding; packaging; multiplexing and encryption in OTT, IPTV, cable and broadcast head-ends. Being fully software-based, the solution can be flexibly deployed on dedicated hardware, virtualized or in the cloud. With full insight in service performance, operators can confidently roll-out new services and configuration changes. Issues can be identified within seconds, regardless of where in the delivery chain they occur. “Our line of Analyzer probes provides complete support for today’s video technologies, including HEVC, SCTE-35 ad insertion, HLS7, DASH264 and UHD. The high capacity probes can be deployed on bare metal, virtualized or in the cloud, enabling full flexibility in deployment. The Agama solution fully supports automated configuration and deployment, making it ideal for virtualized head-ends,” says Johan Görsjö, Director of Product Management at Agama Technologies. Attendees of the industry trade show IBC2017 in Amsterdam (September 15-19) can learn more and experience Agama’s video assurance solution for next-generation head-ends and services at stand #5.B72. Contact events@agama.tv to pre-book a meeting and get priority timing with our onsite specialists.